Three hundred and ninety million year old fossils have shown that scorpions have altered very little structurally for the unknown aeons of their existence – and this existence is quite widespread. Found in North and South America, parts of Europe, Africa, Asia, Australia and Oceania, wherever they exist, stories and mythologies have sprung up around them, which has resulted in the powerful symbolism surrounding them. Scorpions tattoo designs are associated with treachery, passion, protection and defence, control, transition, death and isolation and people born under the zodiac sign of Scorpio exhibit some of these qualities. They are complex people, often misunderstood; they are determined controllers, tenacious and single-minded. They are often secretive, yet find it difficult to suppress their enthusiasm for things that interest them. They relish challenge and pack a powerful sting when confronted. You can certainly see why scorpion tattoos would appeal to these characters, but there are also other reasons for the popularity of the design. 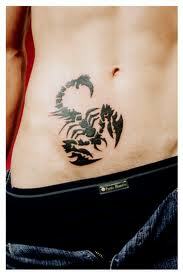 The wearer of a scorpion tattoo is conveying a clear message that he or she is someone to be very wary of. Don’t tangle with them and you will be fine, but cross them and you will feel the sting in their tails! 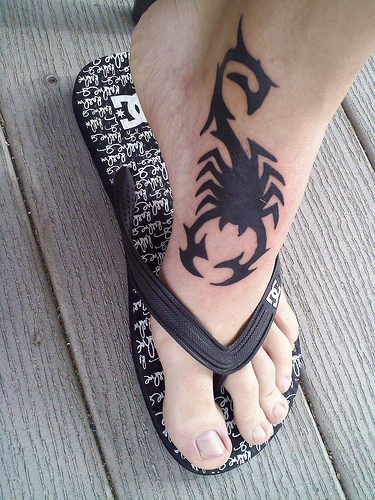 Although scorpion tattoos can look very good in monochrome or duotones, brightly coloured ones can be very attractive and soften some of the harsher connotations of the creature. When looking for your printable scorpion tattoo, look carefully at the colour combinations, particularly if you want a realistic representation. Size is also important and will probably be dictated by the area you have chosen to have your tattoo inked. Smaller designs will have less complex artwork in them, and may not look as good. A large and detailed design is preferable, so a large body area, such as the back or shoulder is a favourite position for larger tattoos. Tattoos are a lasting art form and should be something you are happy to live with for a very long time. If you choose your printable scorpion tattoo wisely, it will make a unique statement about you that will become as familiar to yourself and others as your eyes and nose.